This can result in a situation wherein some or all of the applications from one of these packages fail to launch properly or showing up, because the name you assign for an application is decisive factor for the App-V Client; it cannot tolerate identical names or ambiguous names between different virtual applications on a same client. We all know about what a unique name for virtual application means, but what about the issues related to ambiguous naming are all about? To fully understand the problem, let’s first look at the application naming in general when it comes to App-V OSD files. Together these two texts form a fully qualified application name for the purpose of identifying one particular virtual application from all the other virtual applications you might have. Interestingly enough, App-V Client does not internally use GUID value present in SOFTPKG –element in identifying virtual application; that one seems to serve no purpose at all. So the name and version fields define the virtual application represented by the OSD file to the client. Note that for the actual application shortcuts – created to the user’s Start Menu or desktop by App-V Client on behalf of application itself – use only the name part instead of combining both name and version to one very long name. This design decision was likely done because usually by default the version field contains all sort of “crap” as Sequencer digs up the name and version information from the target executable. To be honest, I’m actually not being a 100% accurate here because in the past SoftGrid used to use the version field’s information too in the shortcuts it created, but that hasn’t been the case anymore for a long time now. As you can see, the version number is rather long – not the longest or ugliest I have seen before, though – and so who would want to use that sort of text in their shortcut names, right? And when you do certain operations with the sftmime.exe command, the whole long fully qualified virtual application name is also required – and in case sensitive manner I might add! Ok, so now we know that we have both name and version -information in each OSD file, by which the App-V Client recognizes the virtual application on a client and which also defines what the user will see as a shortcut name. In the default case that is, I should say, because you can actually customize each shortcut name by changing DISPLAY –attribute found in the SHORTCUT –element. After seeing how the name for a virtual application is formed in App-V, what does it mean to have issues in clashing naming between two different applications across the packages? This problematic situation arises if you name two of your virtual applications too close to each other. And by close I mean messing up with what goes into name –part and version –part of that name and not being consistent naming-wise. One of my best practices has always been to clean up the name and version information into the form that can be presented to the actual end user. 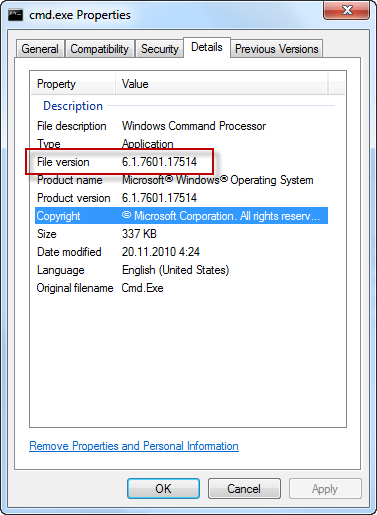 Usually automatically picked-up information is correct for the name –part but as we saw with the cmd.exe example, version information could pretty much be anything. And since we also noted that the version information does crop up in various places in App-V Client, it’s a good idea to do some prettying of that. Well, not fine at all really! This does not only introduces the possibility of having ambiguous name problem when both applications has been imported into the App-V Client, but it could also mean that the one or more of the application shortcuts from some package will disappear without warning. The reason is that while the App-V Client itself is satisfied when it comes to unique naming of virtual applications themselves, problem of having two shortcuts with the same name remains from the Windows’ standpoint if they both are targeted at the same location (say, desktop)… which is very plausible when you re-package the same application multiple times in different configurations. At the core, shortcuts created by App-V are just a simple .LNK files and naturally you cannot have two identical filenames in the same directory (which the desktop and start menu folders are, in technical sense). However, you could have a 3rd party method for creating shortcuts, like User Environment Management (UEM) solution or your own scripting, and these might refer to virtual application by using only the name –part as a parameter. If I have two applications that have the same name -part, but differ in the version –part (like my Design Review example), that would then be sfttray.exe /launch “Autodesk Design Review” as a command line. What happens is that App-V Client looks through that list of virtual applications know to it, and sees that there are two applications called “Autodesk Design Review”. Which one to launch? There’s no telling! So the client gives up and does not even try to guess it. And it used to be even worse that this: in some earlier App-V versions even having another virtual application’s full name as part of another one’s name –part caused this same error to appear. That is apparently now fixed in the 4.6 SP1 at least, but it’s something that users of older clients still should be aware of. So all in all, you should be very aware of how you name your applications. If you intend to package the same application suite in multiple versions, it’s especially important to pay close attention to how the names appear both from App-V’s perspective as well from Windows perspective. And usually the names need some forward thinking (how’s your environment going to be) in addition to backward thinking (how your existing packages are). Isn’t the official way to start apps using NAME VERSIOn and not just NAME, so the last error shouldn’t occur (unless you of course have two apps with the same NAME and VERSION)? Sure, it’s the official way (App-V Client itself uses NAME+VERSION in the parameters), but I was only referring to the case where you might have 3rd party (UEM) / manual method of creating shortcuts which only happens to use NAME part. And as I wrote it has been getting more relaxed, this error message was far easier to had during 4.5 times even with full NAME+VERSION combination if another app happened to match the NAME part with its NAME+VERSION. Like “Office Excel 2003” and “Office Excel 2003 11.0”. Kalle – This is a very detailed post about application naming that I learned a lot from. It’s helped me save a lot of frustration I’ve been having since getting started in application virtualization. I look forward to reading more of your posts, sounds like you have a lot of expertise. Thanks again.